Even if antiquity and the Italian Renaissance might be the starting points of this archetype vision, nowadays, architecture still seems to suffer from this elitist image. The collective representations are tending towards fixing a typical architect portrait, between the artist and the technician, whose clients and sleeping partners are mainly powerful men. Architecture is associated as a noble and dignified profession, linked to a high level and a privileged way of living. The architect is understood as an important intellectual and iconic person, side by side with the highest circles of society. Some architects contribute to the universal caricature of their own profession, getting involved in this society process while behaving in order to fit with the collective representations and fantasies about architects. Can we say that the punctual and explosive interventions for improving the city led architecture closer to advertisement? This thought makes architecture a pawn on the chessboard in the competition for support. : Through figures whose freedom of expression and so whose personalities are always more assertive. Before, they exercised their profession in a way that was serving architecture as a mirror of culture, historical context, geographic context and line of thought. Today they are tending towards a fully paid shared eccentricity. The result of these architectural behaviours, which seems to mainly deal with formal architectural aspect, questions the mission of architecture. Can we reduce architecture to an image that is sold and consumed without generating a meaning? How much freedom from substance can an architect get based on his reputation as creator of luxury products? Furthermore, performing architecture aims to reach as big part of society as possible. It could represent an important danger for architectural richness to address it to the smallest common denominator. Then the architect has to think about architecture that is understandable for everyone. In this point lies an ambiguity: On one hand, the most obvious is the intention of architecture, the easiest people will be able to notice it. That means that, in order to be obvious, the building has to contrast with the environment. That can lead to a lack of meaning of this architecture in its context, and more than that, it can lead to a loss of niceties and finer points in architecture, which more difficult to get, or invisible for most of people. This last point can be seen as a contradiction considering the architect’s will to express (or to over-express it star architects case) his subjectivity. On the other hand, it seems that if those kinds of architecture are the most appreciated, it may be linked to what is not understandable, or meaningless. That is to say that it refers to codes very different of ours, making it more attractive in a way. The architect becomes the person of taste, who is able to manipulate languages that people are not used and so not able to read. 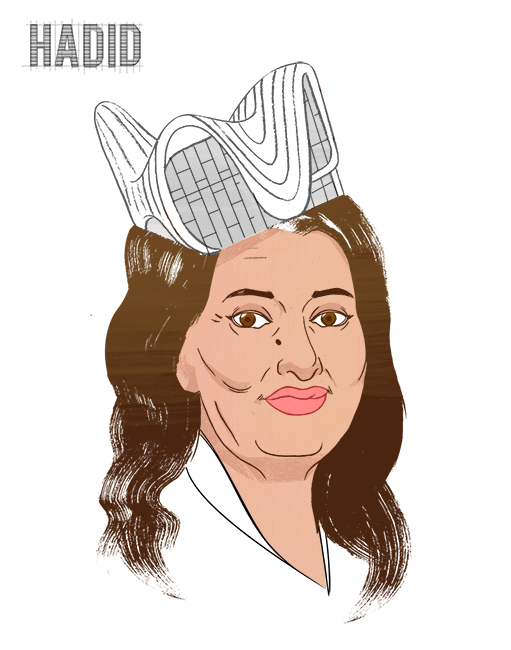 Nowadays, Zaha Hadid’s architecture is representative of the vocabulary poverty that can be used to enrol architecture in a contemporary heritage. In her work, she uses few systematic codes to express modernity: huge building scales, large and sanitized spaces, white colour, with smooth and polished materials, curves, without any right angles. These architectural codes tend to cut architecture off from the function, and so from human conception. In his strong position, the architect, tasteful dictator, makes people dreaming in forms defying gravity, defying humanity fitting with an early dictated vision of futurism. We can consider that this purely formal architectural approach, contributes to abstract it from the uses. Architecture is defined as a support to uses, then, it becomes harder to fix the borders between architecture, design and art. As we can speak of the artistic movement called «Art for Art’s Sake», it would be justified to speak here about an unconfessed «Architecture for Architecture’s Sake». Then, it questions architecture legitimacy.